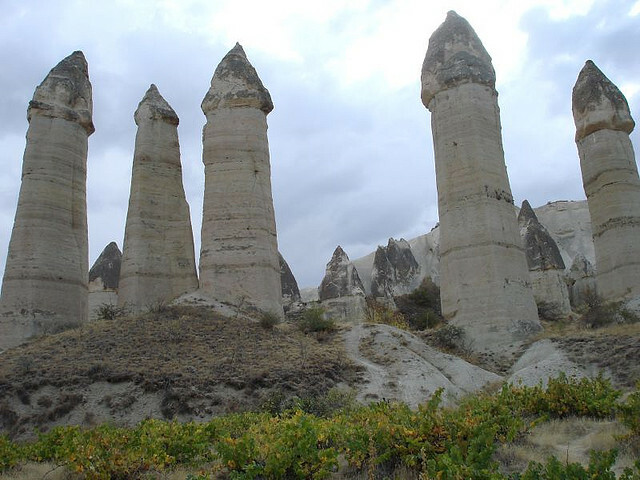 Love Valley near Goreme, Turkey is famous for its bizarre ‘fairy chimney’ rocks cut naturally by the wind and rain. 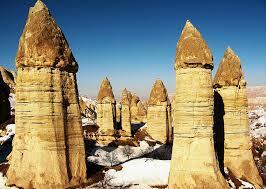 Göreme located among the “fairy chimney” rock formations, is a town in Cappadocia, a historical region of Turkey. It is in the Nevşehir Province in Central Anatolia and has a population of around 2,500 people. Although the rocks may make people smirk, they are simply the result of ancient volcanic eruptions, approximately 9 to 3 million years ago during the late Miocene to Pliocene epochs, which covered the region with thick ash that solidified into soft rock many metres thick. Erosion from the wind and water left only its harder elements behind, forming an unusual landscape of cones, pillars, pinnacles, mushrooms, and ‘fairy tale chimneys’, some of which are up to 130 feet (40 metres) high. 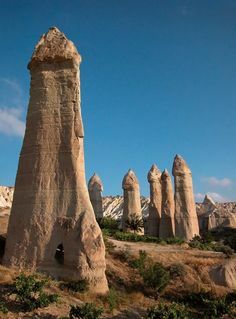 The huge phallic formations may look like a homage to male fertility, but they have been naturally formed by erosion of the volcanic rock. 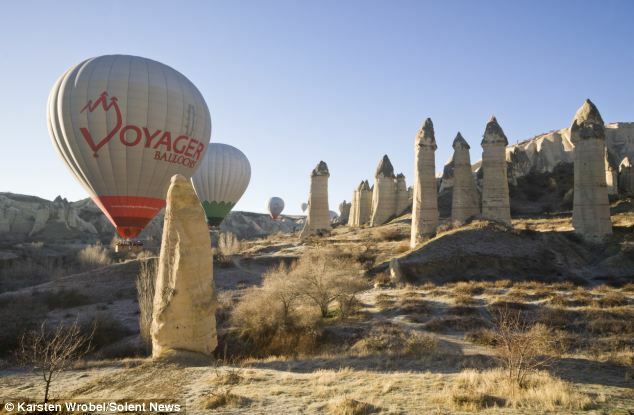 The famous region of Cappadocia has seen an influx of tourists travelling by hot air balloon to check out the phallic-shaped pillars, which have been dubbed by some travellers, the ‘c*ck rocks’. Every morning before sunrise, hundreds of hot air balloons rise into the air above Cappadocia, each holding around a dozen passengers for dawn-time hot air balloon travel, floating above and around the beautiful rock formations that has also jokingly been referred to as ‘willy valley’. Cappadocia, or ‘Kapadokya’ in Turkish, translates as ‘land of the beautiful horses’ and tourists often catch a glimpse of long-maned horses galloping through the formations.